Ready to Succeed Small Business Program is a business preparedness course consisting of bimonthly, hour-long classes spanning 3 months totaling 6 classes per semester. The Summer/Fall Semester will begin July 16th, 2015 and the plan is to repeat it twice a year. Each cohort is comprised of a morning and evening class with up to thirty local and independently owned businesses. The program is valued at $1,600 for businesses, but it’s completely FREE to locally owned businesses in the International Corridor. 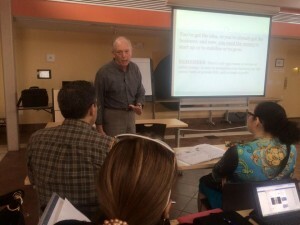 The curriculum covers all aspects of preparing a business plan, running a successful business in the 21st century including software systems, finance management, human resources, customer relationship, visual merchandising, and capitalizing a business among other topics, in addition, the program offers one on one counseling. Each business that completes the course will be certified Business Success Ready, and will receive a Certificate from the program and may qualify for additional supports. Your Customer, Your Concept, Your Cash: Clarify your concept and customer segments and learn how the “Ready for Success” program will strengthen your business, volume, and profitability. Fiscal Fitness: Understand the “money machine” that powers your business, the five financial statements essential to capitalization, and the “Five C’s of Credit.” Can your business become bankable!? Systems: Methods you can employ to meaningfully analyze your business, establish Key Performance Indicators, and drive efficient operations and profit. Human Resources: How you can motivate staff to provide excellent service, increase sales, control expenses, and care for your business and customers when you’re not there to manage the operation. Marketing: Now that you’ve established a well-conceived business model, learn how to communicate effectively with your customer segments and foster long-term, profitable relationships. Keeping it All Together: Learn how to access resources for small business, prosper from a Buy Local campaign, sustain profitable operations, and work to create a meaningful exit strategy for your business.